With a traditional looking design, the latest addition to Panasonic’s Lumix CSC range the GM1 is, arguably, the firm’s slickest camera yet. It has the same 16-Mpix-resolution sensor as the larger, rangefinder-style GX7, and although housed in a tiny aluminum shell it features a 3-inch touchscreen LCD, plenty of manual control and an electronic shutter capable of 1/16000th max shutter speed and 40fps burst. Read on to find out how this super-compact model performs. 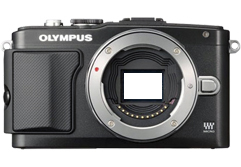 Following on from the enormous success of the OMD- E-M5, the firm has now upgraded its flagship PEN E-P model with a ‘5-axis’ stabilized 16-MPix MOS sensor. Read on to find out how well it performs in our labs. Samsung is one of the few makers with the capability to supply sensors for its own mirrorless cameras. The Wi-FI enabled finder-less NX300 and NX210 are just two of such cameras from the consumer electronics giant featuring an APS-C size 20.3Mpix CMOS image sensor. Read on to find out just how well these cameras performed in our lab. Panasonic’s Lumix DMC-G6 is the update to last year’s DMC-G5 MFT camera, the firm’s $750 mid-range EVF equipped model sitting above the entry-level finder-less DMC-GF6 yet beneath the mighty video-maker’s favorite DMC-GH3. The new camera features a 16-Mpix Live MOS sensor as well as a new Venus processing engine, but just how well does it perform in our labs? DxOMark Camera Sensor is a raw benchmark for camera bodies by DxO Labs. The benchmark is “raw” because it measures image quality using Raw output files. It is also raw as DxO’s data can be used to cook up camera reviews that cover more aspects than image quality.